A textile panel Soft Cell is in the works, according to Philips and their partner Kvadrat Soft Cells. 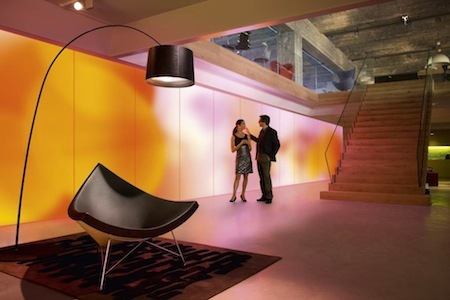 the panels are luminous textiles that work with sound waves to play with ambient light in a room. Luminous textile is a truly flexible way of creating the right atmosphere for a specific space, whatever its function, thanks to the wide range of Kvadrat textiles and broad spectrum of colors in Philips’ LED range. Through integrated LED lights, coupled with the texture of the panels, sound is not only absorbed to create a comfortable working environment but the retail and hospitality experience can also be enhanced through the display of dynamic visual content. With Kvadrat Soft Cells panels, which can be fitted to any architectural design, auditory senses can now be soothed thanks to the textile which dampens noise and softens echoes. The durable Soft Cells are based on an innovative and patented aluminium frame, with a concealed tensioning mechanism which keeps the surface of the fabric perfectly stretched. The central core of the parlor was an icosahedron of display devices, a tent of their best remaining video wallpaper.